Hitting the cue ball accurately is an essential aspect of playing any billiard games. The Cue Ball should be your best friend and as with all good friends, the more time spent on building the relationship, the more will come in the way of respect and integrity. Respect: Respecting the Cue Ball can only be appreciated through years of practiced understanding. Integrity: To know how the Cue Ball behaves once stroked by the cue and its relationship between your cue-tip, the objective balls, the pool table, the cloth and cushions. Below, diagram one shows how close the cue tip should address the cue ball before making the stroke whilst diagram two demonstrates the type of drill that can be set up in order to master an accurate stroke of the Cue Ball through its centre point also known as the ‘Sweet Spot’. 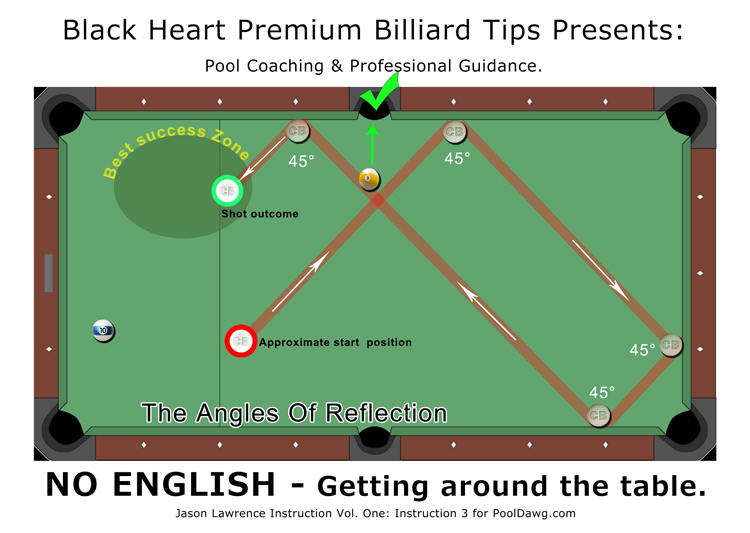 Practice: Stroke the Cue Ball through the centre, as accurately and precise as possible. The precise addressing of the Cue Ball maintains a consistent result to all of your shots, whether it be a subtle or powerful stroke outcome. This is done through your pre-shot drill (Every pool player has a pre-routine before playing each shot, this is known as a pre-shot drill. Do not concern yourself with this should you not have one. I will be covering the pre-shot drill in later instructions. For now let’s hit the cue ball accurately). Keep a mental note of the sound your cue makes as you address hard and slow strokes to the Cue Ball. Once you know the accurate sound of your cue when she strokes correctly will give you a greater understanding when she is under-performing. E.G. An ageing cue-tip may need to be replaced. To master the exercise in diagram one, try placing more pool balls along the vertical axis making it more difficult to execute. Try spending 5-10 minutes per practice session on this exercise, you’ll be amazed how your stroke is improved as the weeks and months go by. Once mastered, the pool player will always hit the cue ball accurately through its centre point, and one will become the envy of all pool players, pro and amateur. 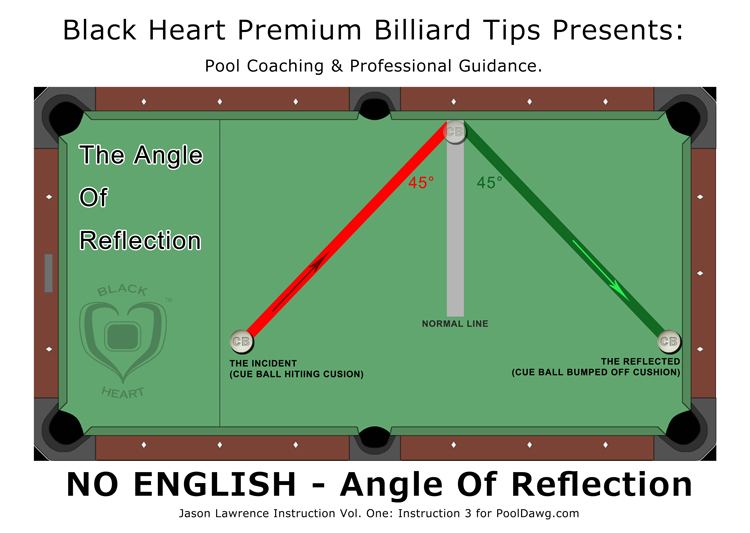 For some unknown reason over the years many pool players have decided to adopt an excessive use of English when addressing the cue ball in an attempt to control the cue ball. This is an inaccurate plan of action which makes the game of Pool too difficult to learn and play. 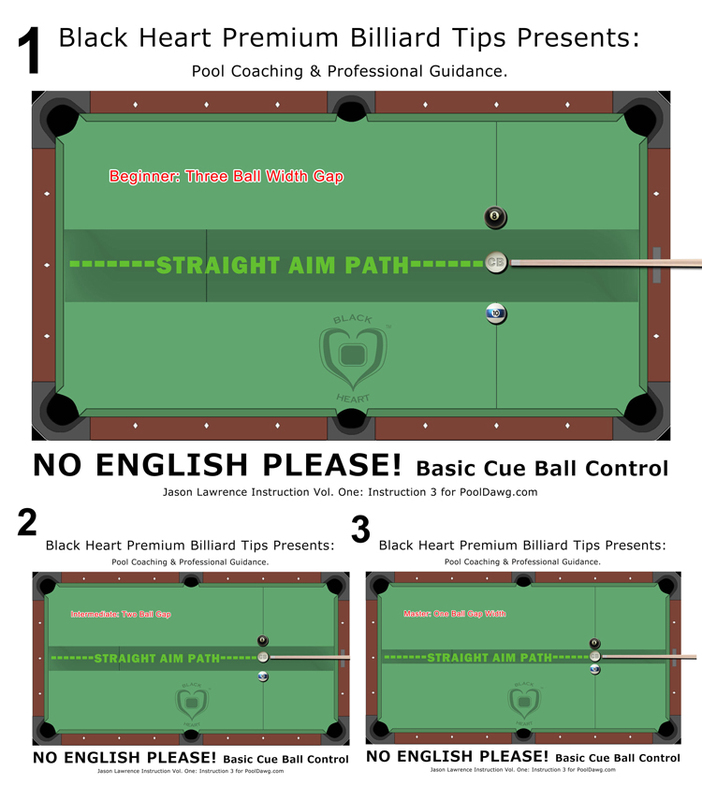 Common Question; So if English is not to be applied to the cue ball, how do I create the correct angles in order to move the cue ball around the table? Answer: Let’s use the cushions! For those unfamiliar with the term ‘English’. An American term Meaning: To apply left or right spin to the cue ball. When the cue ball hits a cushion, an unnatural angle is created increasing or decreasing the natural path of the cue ball depending on the left or right amount of spin has been inflicted to the cue ball. The same is true of a pool ball hitting a cushion of on a pool table. By using this basic law of physics, we can manoeuvre the cue ball around the pool table with precision. By allowing the cue ball and other object balls to behave naturally, we have a very high predictable manner of outcome. Being able to predict the outcome of each shot pre-determines how we ‘Run Out’ during the play of a pool rack. Try the exercise in the diagram below. Stroke the ball in its centre Using the cushions as shown. This will bring a greater understanding and appreciation of how the natural angles of reflection work. The first 3 instructions focused on how to quickly develop the fundamental rudiments of all Cue Sports. From basic elementary Ball potting to knowing your primary duties as a student of Pool Billiards, if practiced regularly will soon have you billed the new Rising Star in your league team. For many teams the road to Vegas is long haul, for others, almost impossible. So the emphasis of the next instruction is knowing how to stay one step ahead of your opponent mentally, even if your physical game skills needs more time for improvement. It’s the night before a tournament or an important league match. Now; It is SHOWTIME!